Yesterday Joshua Freedman (Six Seconds’ COO) and Massimiliano Ghini (Six Seconds’ Director of Global Strategy) presented the first-ever “Six Seconds Breaking News,” a webinar to share the amazing developments that Six Seconds is putting forward in the next few months including the new concept of Brain Style and the Brain Brief Profiles – the Education Vital Signs – and the NexusEQ Conference at Harvard University, featuring International Delegations. A recording of the webinar is available for on-screen viewing – but as Josh was connecting for an internet cafe in Laos, there are some gaps in the audio. Below is a summary of highlights from the webinar, plus, at the end of this page, the webinar slides are available in an annotated form. 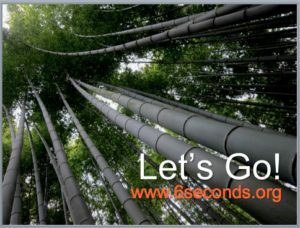 Six Seconds’ mission is to support people to create positive change – everywhere, all the time. In January we set the audacious target that by 2039, 1 billion people would be practicing the skills of EQ (in 2039 we will also celebrate the 100th birthday of our President, Anabel Jensen). “Everywhere” means we need to continue our commitment to bring these skills to every part of the globe. “All the time” means we make these skills part of daily life. We are committed to building a network of people who walk the talk, who PRACTICE the skills of emotional intelligence to make a positive difference. This means it’s time to dramatically multiply our efforts and bring EQ to a much wider audience. One way we’ll do that this year is the Brain Brief tools. The Brain Brief Profile is a 1-page snapshots of your brain’s current style for processing emotional and cognitive data. Brain Brief delivers a powerful, simple introduction to emotional intelligence. While you get the full psychometric power of “Level B” assessment, The Profiles are “Level A”. They be used with minimal training – and are suitable for the general public without a specialized debrief. 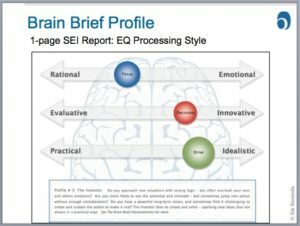 A special online training will be available in the next months to enable someone to become a “Certified EQ Profiler” to use the Brain Brief. In Q1-2013, the Brain Competency Profile will be released to go deeper into Brain Style at work. Then, in Q2, the Brain Selection Guide will enable HR professionals to use Brain Style in the selection process. 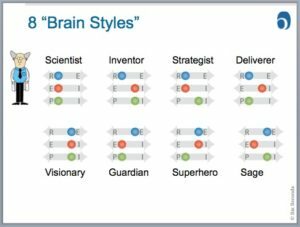 “Brain Style”: a picture of how the emotional and rational parts of your brain are working together. Focus: Do you prefer emotional or rational data? “SEI Profilers” will have access to the Profile tools (starting with Brain Brief next month). Brain Style is assessed using the full power of the SEI Assessment. Certified SEI EQ Assessors can also request a full “Development” or “Leadership” report as a followup to the Brain Brief making it an incredible resource to go from introduction, transformational learning, to followup. Since 2001, we’ve measured organizational climate as a framework for working on EQ. When trust, for example, is low, EQ skills are essential. In 2010, we released the new Vital Signs Suite. Organizational Vital Signs (OVS). Team Vital Signs (TVS). Leadership Vital Signs (LVS). They share an incredibly powerful, simple model for understanding performance. 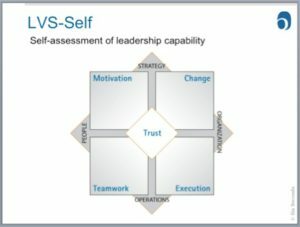 In early 2013, we’ll release the “Leadership Vital Signs Indicator” — a self-assessment version of the LVS. 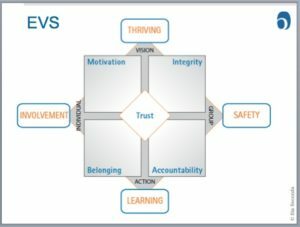 The LVSI will make this tool much more widely available and easier to use, creating a powerful way to introduce our framework of leadership: Creating a context of trust where people are motivated, adaptable, working cohesively, and executing effectively. In 2002 we published The Assessment of School Climate, a validated tool for mapping the current learning environment. School climate is a massive predictor of key performance outcomes. This year, we’ve re-validated the tool and created norms based on the last decade, offering a benchmark to see how a school is performing. We’ve updated the tool to a variation of the VS Model, as shown the the left. While all the amazing virtual programs Six Seconds offers are wonderful, sometimes we need to get together to have the in-depth conversations that create transformation… and build real expertise. 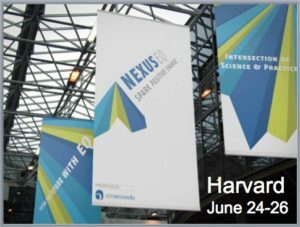 We’ve made the commitment to have a NexusEQ Conference every 4 years – the year after the Olympics! In the alternate years, we’ll continue the fabulous virtual program, 24EQ. This year we’ve managed to hold the conference at HARVARD UNIVERSITY in Boston, June 24-26, 2013. The 7th International NexusEQ Conference is about using emotion to catalyze a prosperous, vibrant, compassionate future. Nexus means INTERSECTION – the point of change. It’s about the intersection of science and practice. Neuroscience meets leadership meets learning. So we have a remarkable set of keynote speakers – scientists, change makers, educators. The conference will also feature a track for YOUTH. Delegates are invited to bring children, ages 9+, to be part of drafting a vision of a future worth creating. Because we are a global network, this year’s conference will have International Delegations of 6-20 people coming together from one country. 3. 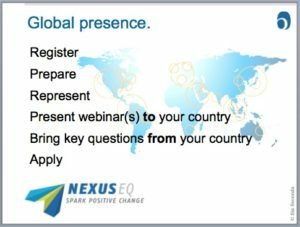 Deliver at least one free webinar from the conference back to their country (we’ll help w/ technicalities) so that the key ideas of NexusEQ are broadcast in many languages, many places, in a way that will make sense. Register your interest in being part of – or helping to lead – a country delegation here. If we are going to have 1 billion people practicing the skills of emotional intelligence, it’s going to take ALL of us fully committed to doing our part to support positive change. Fill in this simple form and we’ll automatically email you the annotated slides from this webinar, including notes about each slide. I look forward to the tools that will make this ’cause’ contageous!!! Hi Rita – the new Brain Brief Profile is only a couple weeks away. Today I’m working on editing the Interpretation Guide. This is the most exciting endeavor I have heard for global positive change EVER!! Thank you Josh and everyone at Six Seconds for making this possible and inviting us all to play. I intend to spread it as far and wide as I possibly can! Thank you for being part of it Lynda! So far the sharing and write-ups are focused on measuring the brain’s performance. My understanding of EQ is nothing to do with what the brain thinks or how it performs, it is a matter of how the heart perform and influence the emotion level and trigger actions coming from the heart. The consciousness level of how the heart thinks is not what is pictured in OVS, LVS and EVS, or is it?